I have been working with cold porcelain (cp) for 12 years now. 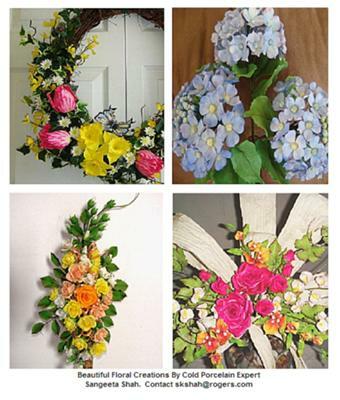 I have a lot of experience with it as I teach it and make custom florals for wedding and parties and cakes. I not only make florals but make models too. I give all credit to my husband for encouraging me and letting me grow to what I am now with my cold porcelain flowers. He is my motivator. In India, cold porcelain was used to decorate earthen pots and then was colored with oil paints. With research online we find that it was a traditional folk art in other countries too. I had done cold porcelain and bread flowers as a child with my parents. I had forgotten all about until I was re-discovered it in Sharjah (United Arab Emirates). A local Arab lady was teaching it through her store. This is when I learned her techniques of coloring the cold porcelain flowers (dipped in a water mixture with fabric dyes). Then I indulged myself in the art of sugar crafting with a New Zealand lady making sugar flowers. I then incorporated my sugarcraft techniques with my old cp techniques in order to improve my flowers. I bought real flowers which were available in Dubai and examined them thoroughly and would try my best to replicate them to the nearest. I would look and read through the plant encyclopedia to know the very details of the plant, flower or leaf which I could not find in the floral store. I exhibited my work at many groups in Dubai and Abu Dhabi and was interviewed by the main local newspaper media people (Itihad news papers) in 2000. Thank you, Peter, for giving me the opportunity to tell everyone about my work. I will give some explanation of recipes in a separate article - see 'Cold Porcelain Recipe' or alternatively Go direct to my cold porcelain secrets DVD. (editor's note. Compare this freely available recipe with professional artist Nicole's :- 'commercial' recipe here. Please be sure to leave your comments on the site to help everyone out). Thank you so much for sharing memories of your culture and your childhood. To me this material of Cold Porcelain represents a wonderful folk art - with recipes and tips being passed down from one person to another and sometimes from one culture to another. So glad you are here Sangeeta!!! Hi Sangeeta. Your art is so very beautiful and exact. I really wish I could go to Canada so you could teach me in person. I admire your work very much. It's also interesting to read about your beginnings with cold porcelain and how thorough your techniques are. Do you think we can get Peter to try cold porcelain? I am so glad to see you are posting your beautiful flowers for the world to see! Sangeeta, I just love what you do. And, I have always wanted to take classes with you. Did I see a video or a DVD that you have done? I am buying!!! I've finally tried the cold porcelain recipe and it is a great medium. However I did encounter a couple of problems. In joining calyx to flowers I notice that after drying the shrinkage created small spaces in between. How do I avoid this problem. I also notice that it is harder to soften edges with regular gum paste tools. Is there a trick that I am missing or do I need to use other tools for this medium. In joining calyx to flowers you have to apply glue to stick them together. If there is not enough glue then the two parts will not stick well and will separate as they shrink. I also notice that it is harder to soften edges with regular gum paste tools. You just have to get sed to the gum paste tools. I use them all the times. no special tools are needed. Having said that look around your house and find anything which will help you and that turns around to be the right tool. I also look for sculpting tools which are very handy in detailing work. The gum paste tools and cold porcelain tools are the same. Hope this finds you helpful. Happy claying! I'm interesting by cold porcelain, and I want to know where can I buy the material. Hi, i am thrilled to find your site/page. long time back while in bombay, we were in the same bonsai group, and you gave a demo of ceramic flowers, iwas bowled over! by luck i also went to dubai and learnt a little, but had to back. i am happy that ,an enthusiast has done so well, i wish i could get out of family hindrances and follow my dream to make ceramic flowers. I really appreciate your work and talent, I too want to learn to make cp flowers do you know anyone who can teach me in Michigan livonia city. I have noticed a couple of differences in the recipe here and on your youtube video. Will the past turn out the same? Which recipe do I follow for the best results? Can i use this cold porcelain recipe to also cover a dummy cake as well as do figurines and flowers or do I need to cover the cake with another type of clay or porcelain?